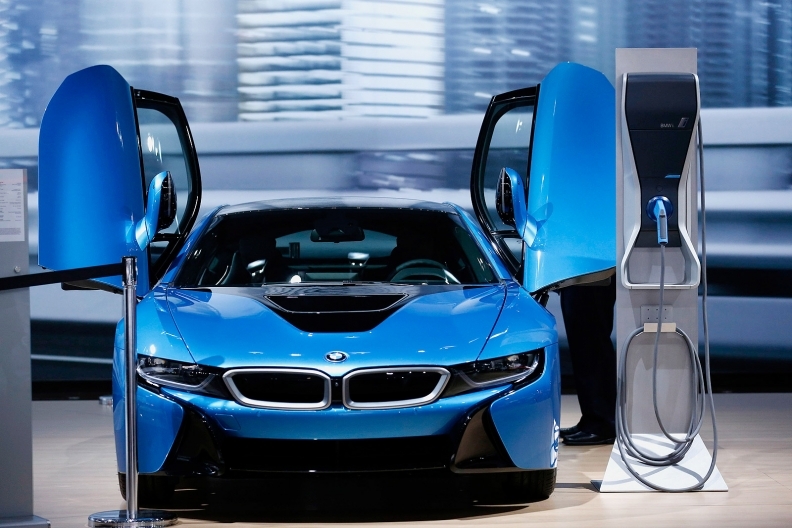 BMW to boost i3, i8 availability in U.S. In the U.S., BMW has tallied 3,104 sales of the i3 and 67 deliveries of the i8, pictured, through September. PARIS -- BMW plans to allocate a higher share of i electric and plug-in hybrid output for the U.S. in the coming months, Ian Robertson, the company’s board member for sales and marketing, said today. BMW has sold 10,000 i3 compact electric vehicles and 280 i8 plug-in hybrid supercars worldwide to date, Robertson said. The i3 went on sale in Europe last November and in May in the U.S. Sales of the i8 began in the U.S. in August. Both cars are assembled at a plant in Leipzig, Germany. BMW is producing about 100 i cars each day, “and we are selling about 100 a day now worldwide,” Robertson said. There have been more than 130,000 test drives of the i3 globally, he said. Robertson said BMW is considering increasing production of the i8 because of heavy demand. In the U.S., BMW has tallied 3,104 sales of the i3 and 67 deliveries of the i8 through September. The i8 is sold out through 2015 in the U.S. Deliveries in the U.S. began at the Pebble Beach Concours d’Elegance in mid-August. The plug-in hybrid starts at $136,650, including shipping. The i3 has a base price of $42,300 including shipping. Robertson said the i cars have helped polish BMW’s image as a leader in innovation and technology. Aluminum used to be associated with lightweight technology, but BMW has shifted that perception with its carbon-fiber i cars, he said. “When I look at brand analysis around the world, technology and innovation are really up [for BMW], and that pleases me,” he said.